It's that time of year. We're getting ready to close the books on one year and start fresh with a clean slate. I've been busy organizing my desk and work space - creating order out of chaos and gearing up for another busy, productive year. At least I know I'll be off to a good start in the new year. I'm not one to make resolutions for the new year. I prefer to take it as it comes, to roll with the punches. I try to value each and every day because today is all I have and tomorrow may never come. This past year was loaded with many challenges and obstacles. There were decisions that had to be made, and I had to make some difficult choices. Life is full of choices - some easier than others. While I have no regrets and won't dwell on the negative aspects of 2010, I'm more than happy to bid this year adieu. I have vowed that I will leave 2010 reflecting on the positive. Thankfully my most pressing choice this week has been deciding which color to use for my new booth sample. The downside to being a dyer - if there is one - is that I have so many color options. I'm surrounded by different yarn blends in an array of colors. At times there are too many choices. I've narrowed it down to these four and will see if I can settle on one by the end of the day. These are the fun choices in life. Mother Nature did not disappoint with the storm earlier this week. 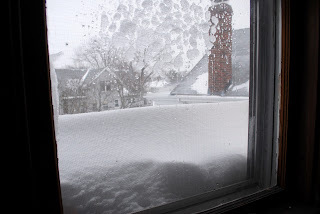 The winds piled up a snow drift in front of a second floor window and created many beautiful snow sculptures. 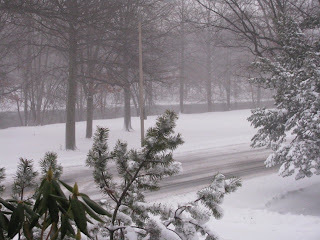 The storm provided my color inspiration for the week, a gray and white combination that is seen only in winter. Wishing you all the best in the new year. May your choices be easy. With the holidays behind us there's a sense of relief. And freedom. While I have a couple of gifts I need to finish knitting, I feel I can start a new knitting project without any pangs of guilt. I suddenly feel I have more time on my hands. If I stop to think about it, I realize I don't have more time - but I can dream. Yesterday I started contemplating new projects. I want to start a new sweater in the worst way, and I have yarn for several sweaters ready and waiting. The reality is I need a new hat, and a pair of mittens would be nice too. The reality is I have a couple of new booth samples in the works and loads of yarn to dye. So I've scaled back my ambitions - for the moment anyway. I have to share this knitting related discovery from the world of Lego. My daughter was examining a Lego set in the Harry Potter series. This is Mrs. Weasley. 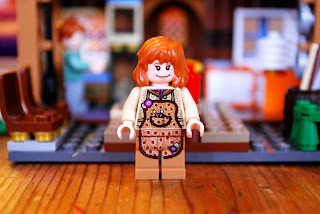 In the Harry Potter books Mrs. Weasley is a knitter. If you look closely, you'll see knitting needles and yarn in her apron pocket. Kudos to Lego for attention to detail. 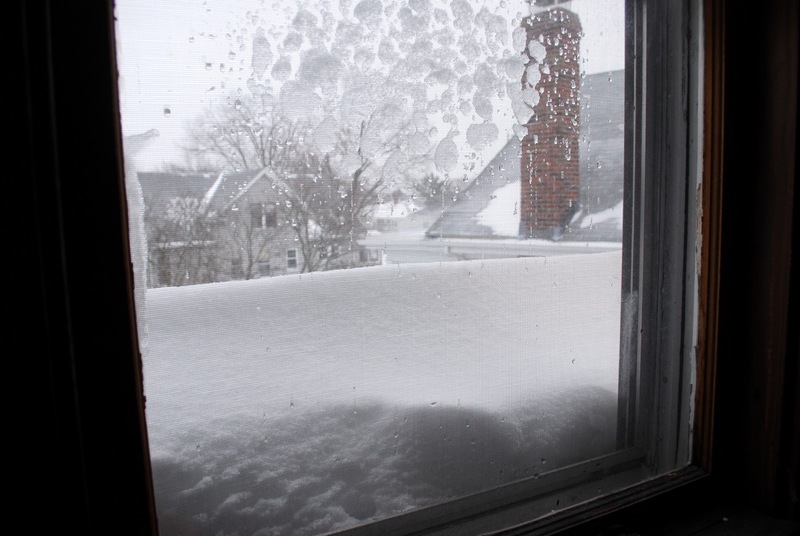 The winter storm that started yesterday continues to snow and blow today. This was the scene from my front steps earlier this morning. A winter wonderland. It's a good day to start that new hat. 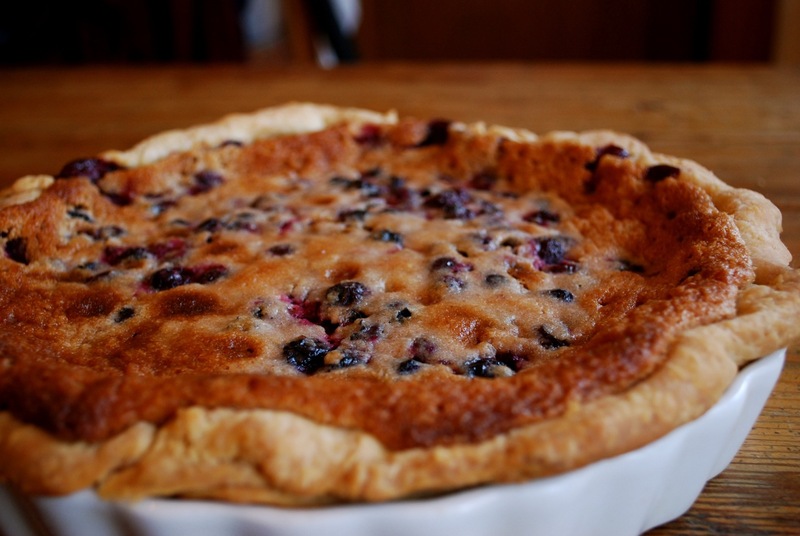 'Tis the season for baking. Baking and eating. We have a long list of cookies that we bake every holiday season. 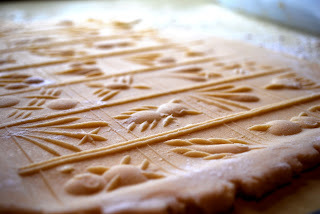 One of the cookies I enjoy baking is springerle, a German cookie made with molds or a rolling pin. 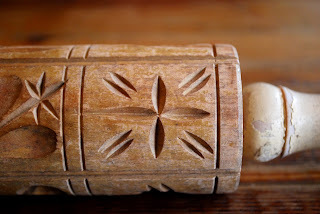 I use a rolling pin. There are hand cut impressions all around the pin. 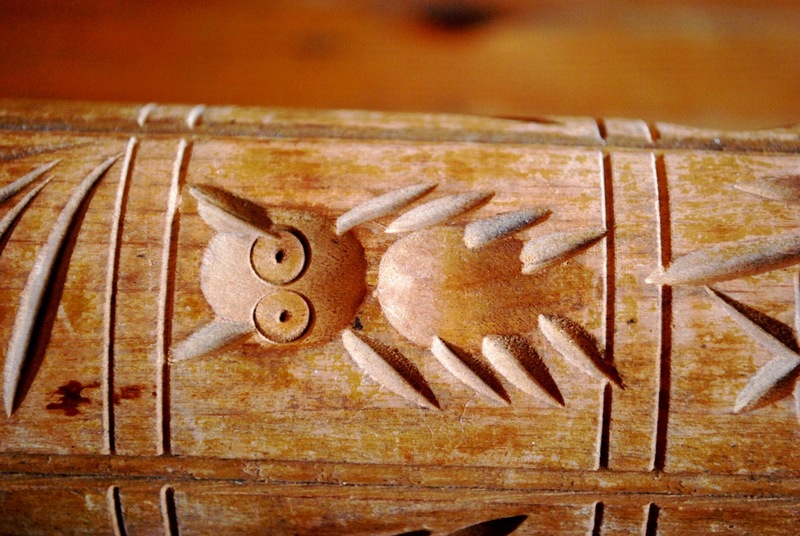 The owl is one of my favorites. 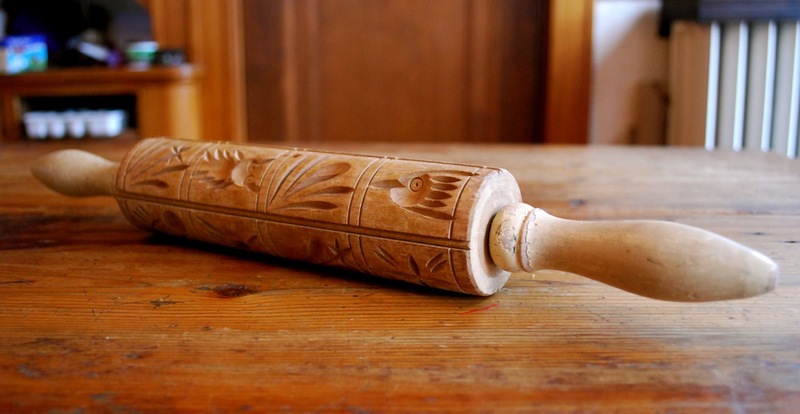 First I roll out the dough with a smooth rolling pin. Then I use the springerle rolling pin. Little cookies ready to be separated. 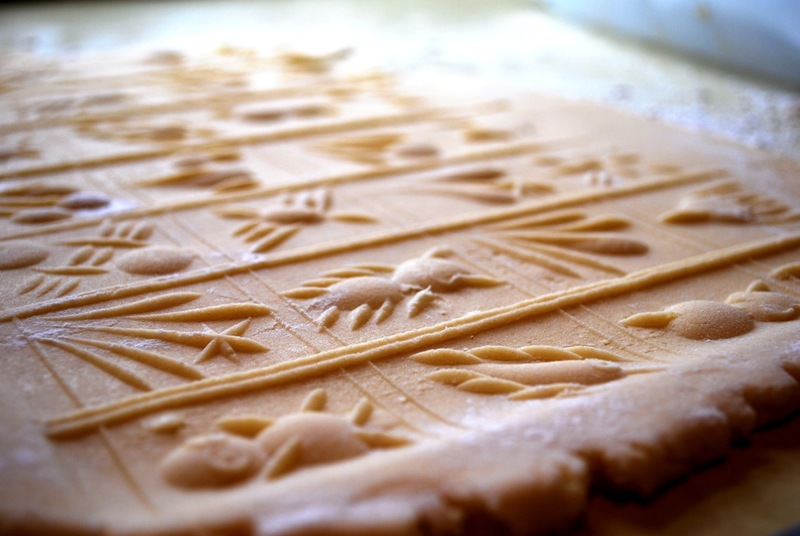 The cookies sit for several hours before baking. I grew up with anise flavored springerle. The cookies are placed on a baking sheet that's been sprinkled with anise seed. The anise seed bakes into the bottom of the cookies. Not everyone in my house appreciates anise seed the way I do, so I'll probably make another batch with either almond or lemon flavoring. When I haven't been baking, I've been knitting. The Cabled Keyhole Scarf has been my friend. Earlier this week I started one at knit night. By the end of the evening it was done except for a couple of rows. We won't discuss the fact that I discovered - after it had been blocked - that I had knit it with two different size needles. I can't tell the difference and I'm sure the recipient, a non-knitter, won't be able to either. Two of three. The third one is still on the needles. And I've been blocking, but I still have a couple of things left. I can't decide if secret knitting or secret blocking is more challenging. I have elves (kids) lined up to wrap presents. There's the matter of bringing in the tree and decorating it. And I should do some cooking unless all we want to eat is cookies. This season is magical, but it requires a lot of work. And so I remind myself . . . amidst the flurry of activity be sure to take time to savor the moment. I've fallen hard for a new pattern. I don't know how this happened. I made a slight substitution in my gift giving list, and now I'm obsessed. Anne Hanson recently released Cabled Keyhole Scarf. I looked at it a couple of times and decided to swap it for another Anne Hanson scarf on my list. I started Cabled Keyhole over the weekend and can't get enough of it. It has a small number of stitches and a fun, easy-to-memorize pattern repeat - all the ingredients for instant gratification. 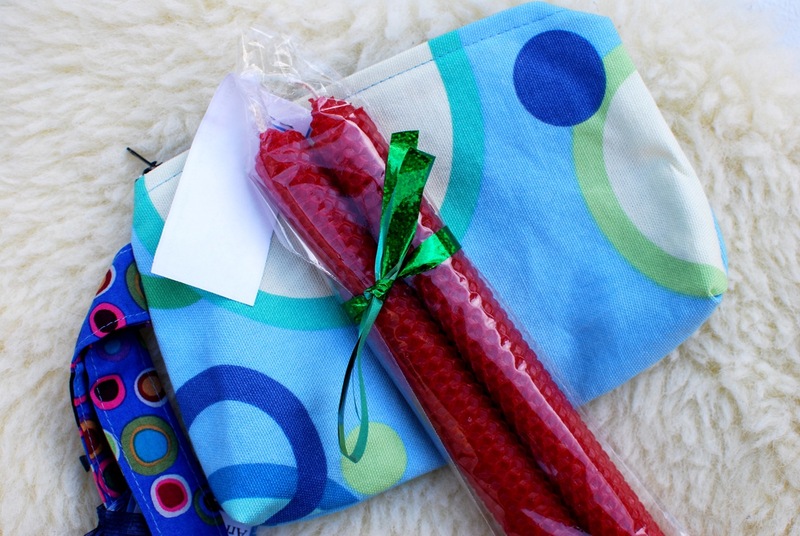 If you're in the market for a last minute gift, you might want to consider this pattern. Since this one will be finished later this morning, I had to line up a couple more. There are times when you can be very busy and industrious but not have much to show for your work. That's where I'm at this week. I've played around with dyes and new colors, ordered yarn for a new line of yarn and searched new patterns for booth samples. But I don't have much to show for all my time and effort. At least not yet. That makes today a good day for . . .
~ 'Tis the season for wreaths. I've seen many wreaths that you can make yourself, some better than others. If you like felted balls, this wreath is for you. I appreciate it when items are recycled, giving them a new life. This wreath recycles old sweaters. Very creative. 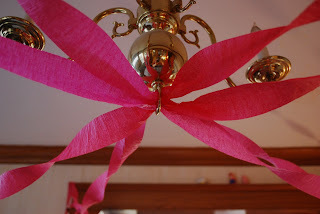 Last but not least, a new use for coffee filters. This coffee filter wreath can be made in either brown or white. Scroll down to see other creations made from coffee filters. ~ In another lifetime I used to embroider. Then knitting took over and there wasn't enough time for the smaller needles. My embroidered projects seem very primitive compared to these embroidered works of art. Painting with embroidery. ~ How about a knitting store/school on wheels? That's what SweaterGirls provide in Albuquerque. They are regulars at the farmers' market and various events around town. I love the trailer - so New Mexico. It's like the bookmobile for knitters. ~ Barb Parry of Foxfire Fiber & Designs is having a Sheep Share giveaway. She is giving away two 2011 Sheep Share memberships. Spread the word and enter to win. Speaking of contests thanks again to all who entered the Celebration Contest. It's not too late to enter. The contest closes tonight at midnight. Leave a comment and enter to win. I've been watching the river that flows not far from my house. 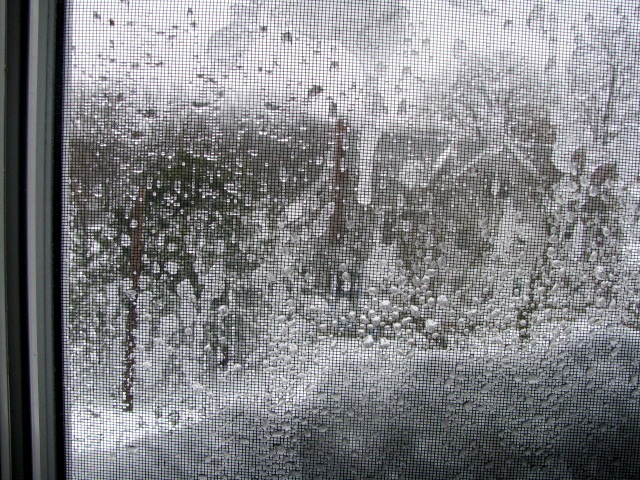 Ice has been forming. Geese and swans still swim in the frigid waters. The light is dim; the trees are bare. The water is like glass with reflections that are dark and cold. 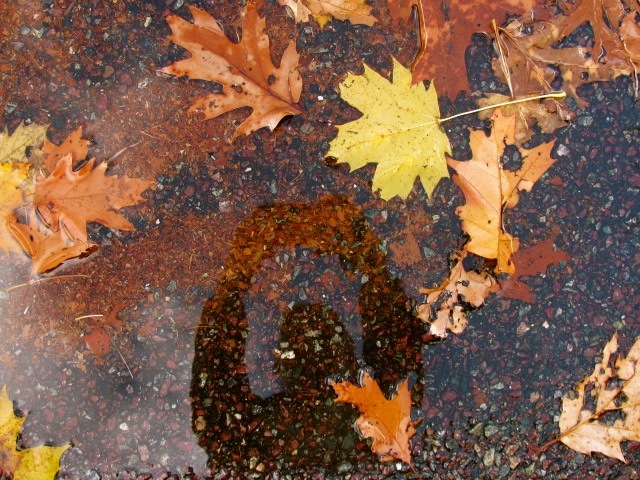 My color inspiration for this week comes from another reflection, a picture taken before everything froze over. Glass with the last colors of fall. 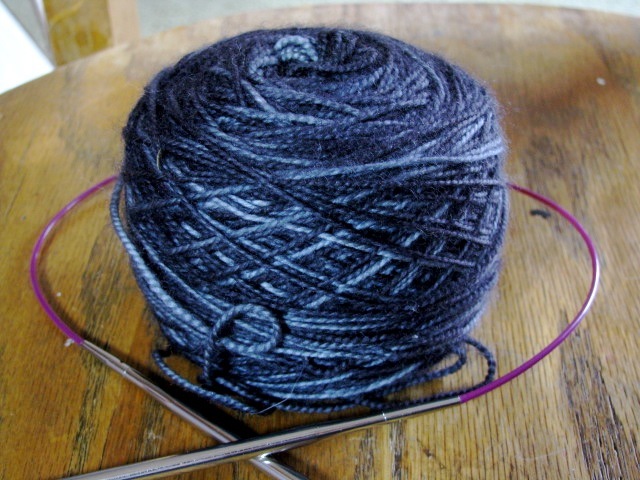 Lately I've been knitting with darker colors - blue, brown, charcoal. These colors have been requested for most of my holiday knitting. While I admit that these colors can be hard on my eyes, especially late in the day, I don't mind working with them. But I think deep down I've been hungry for a splash of brighter colors. Yesterday I dyed some multicolored skeins. I started with this. 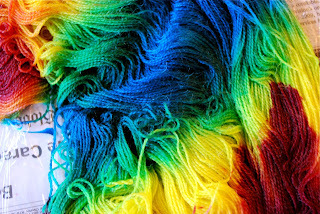 Naked yarn begging for color. This one reminds me of traditional tie-dye. I mixed and matched various colors. This two color combo produced a more subtle mix. Before I knew it time was up. I could have played around for a couple more hours, but the rest of life was calling. And now I have several more color combinations swirling around in my head, waiting for the next opportunity to come out and play. Maybe later on today. Thanks to all who responded to the Celebration Contest. I've enjoyed reading what everyone is working on. There's still time to enter. The contest is open until Friday, December 17. I've been working away on my holiday knitting. My biggest challenge with this undertaking is not deciding on the pattern or the yarn but keeping it all hush-hush. Since most of the recipients are members of this household, I try to knit in secret - get up extra early, stay up way too late, steal a row here or there when no one is looking. The other day a light bulb went on. I had the realization that if I didn't have to keep this all secret, it would be so much easier to make progress on these projects. I wouldn't be burning the candle at both ends. I wouldn't have to lock myself in a room for private knitting time. 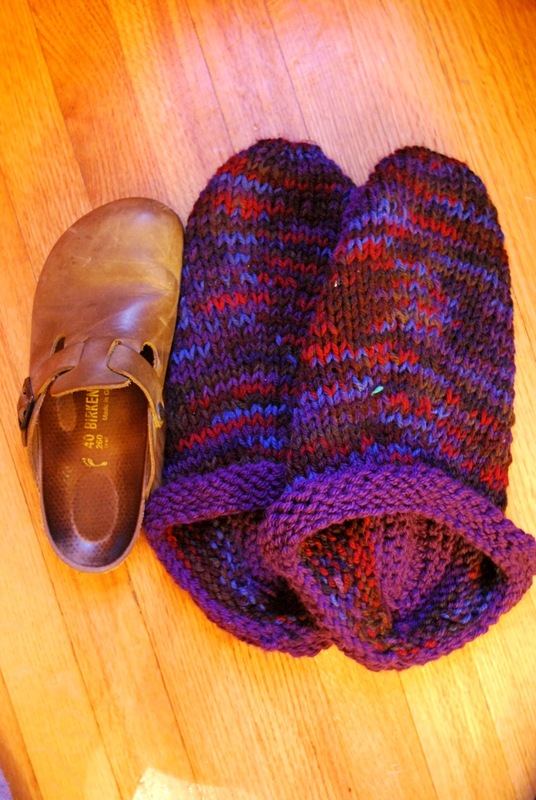 Why not knit these projects in plain view? That way they might actually get done in time. I could wrap finished projects and put them under the tree. I floated this idea to a few family members and was loudly voted down. It seems they like to be surprised by the pattern and by the yarn. Even if the gift they receive is on the needles. Who knew? Personally I think they have a hard time breaking with the tradition of receiving a half-knit gift still on the needles, but I'll go along with it. My secret knitting continues. For all the knitting I've been doing I don't have many finished projects to show. These were completed for a birthday gift. They are huge before felting - I've included a shoe for scale. My daughter requested these felted slippers and picked the yarn from my stash. The irony is that I had bought this yarn a few years ago for my own pair of slippers and hadn't gotten around to making them yet. That will teach me. Some projects are worked in phases. 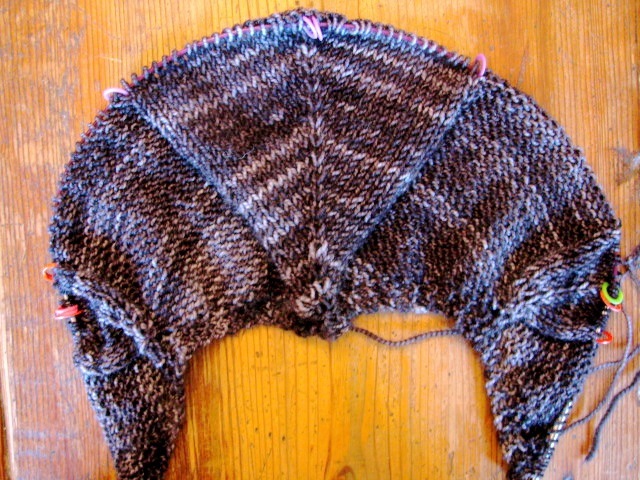 For example many sweaters are knit in pieces - back, front, sleeves. Once the pieces are done they are assembled to create the finished garment. It's kind of nice to work on a project this way - it's not as overwhelming. You work on smaller, manageable pieces, and in the end you have a whole sweater. Creating the Dirty Water DyeWorks website has been like working on a sweater. It's been worked piece by piece, and each piece has been added to the website. Yesterday the last piece was completed. The garment is finished. Paula is now available on the website. 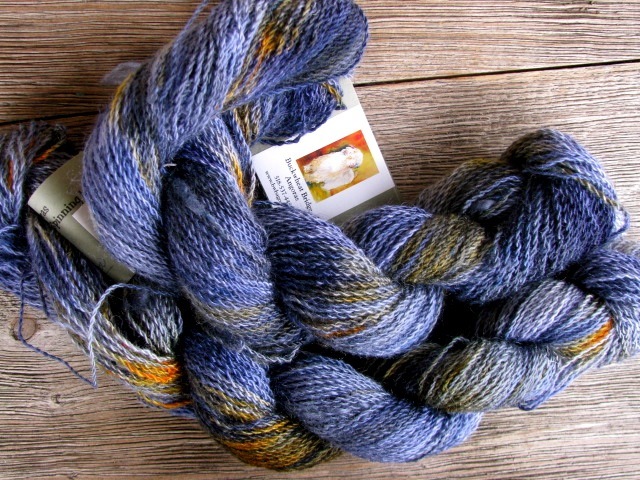 This yarn is 100% Superwash Blue Faced Leicester, 100g / 410yd. 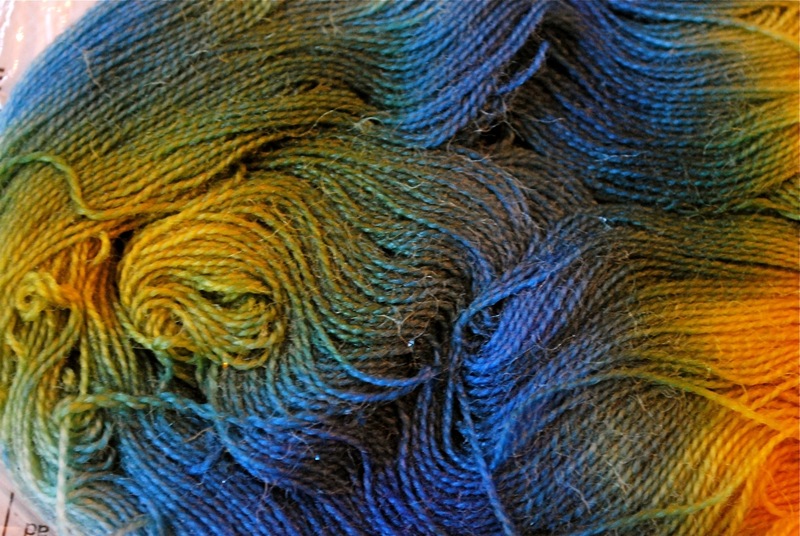 Paula has a wonderful luster that produces rich, vibrant colorways. Stay tuned. There are more yarn lines coming, and they will be added over the next couple of months. In case you're wondering the yarn lines are all named for women in my family. 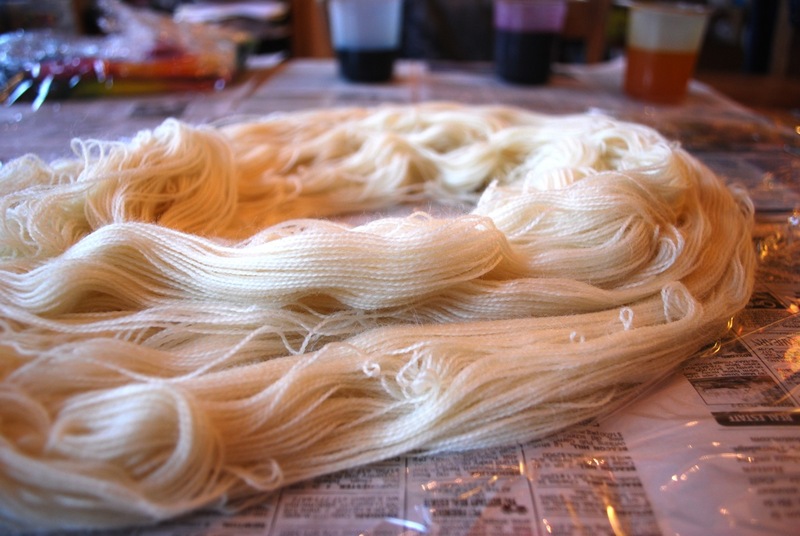 I started with four yarn lines named for my grandmother and her three sisters. Paula was my grandmother. Great-Aunt Bertha taught me how to knit when I was a young girl. Great-Aunts Lucia and Julia rounded out the first four lines. All four women were strong, independent and creative in their own way. Lillian, another great-aunt, was recently added to the mix. To celebrate the completion of the website I'm running a contest. Leave a comment and share what's on your needles. It's always interesting to find out what others are working on. 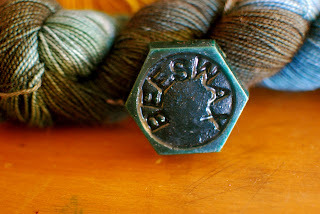 The winner, chosen at random, will select a skein of Dirty Water DyeWorks yarn. The contest will close on Friday, December 17. 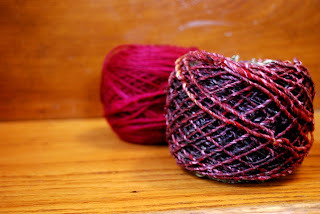 My color inspiration for this week reminds me of twisted strands of yarn. I've been busy finishing up the website. I say finished although I realize it will never be completely finished. I've come to think of the website as a work in progress with ongoing changes and updates. Being able to add, delete and change is part of the process. Lucia has been added to the website. Lucia is a blend of 75% Superwash Merino and 25% Nylon, 100g / 464yd. 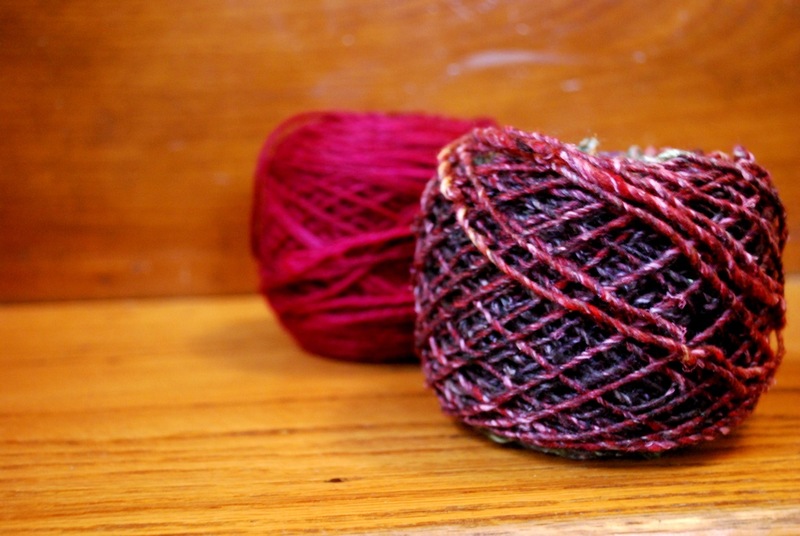 This is a great yarn when you want something that's a bit more durable. I will be adding more Lucia colorways in the new year. That leaves one more yarn line to put on the website. There are just a few more pictures to get ready. Five to be exact. And I will be adding more yarn lines in the coming months. That's the fun part. If you're looking for holiday ideas, you might want to check out the Christmas issue of inspired ideas. This ezine has lots of projects from simple to complex. It's a great way to get the creative juices flowing. Recently I was gifted with this. 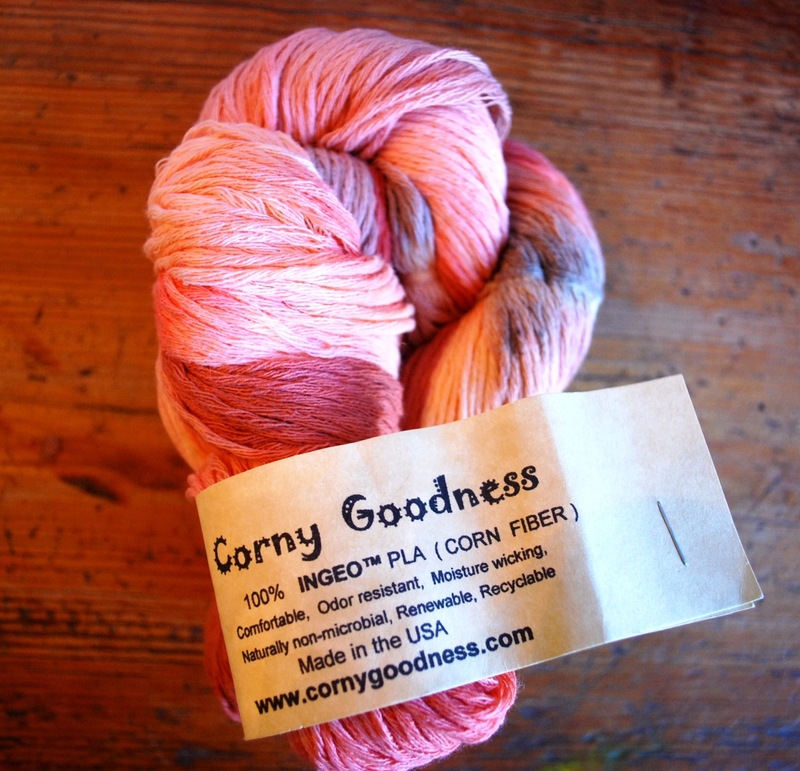 Corny Goodness, 100% corn fiber. It's a bit rough, but I've heard it softens after washing. I'm looking for project ideas. 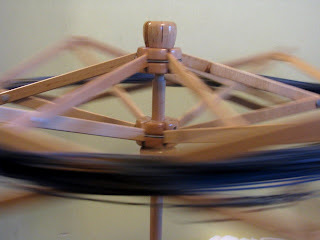 It's not that I don't already have a long list of projects, but my mind wanders. If you've used this yarn, let me know what you made with it. Here we are - another Monday morning. The website has been updated with Lillian. This is the yarn that I used for my first (and second) Pogona. 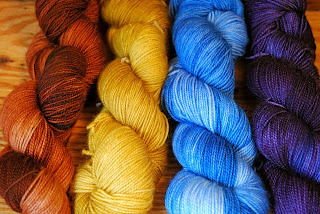 Lillian is 100% Superwash Merino, 100g / 400yd. This soft, bouncy yarn has the benefit of a firm twist for additional strength. All shipping charges are free. I have knitting progress to report but can't share it just yet. In addition to the holidays I have two December birthdays I'm knitting for. 'Tis the season of secrets. While I've done very little when it comes to holiday shopping, I did treat myself to a couple of things over the weekend. Hand rolled beeswax candles and a bag for knitting notions. The candle maker also had pieces of molded beeswax. 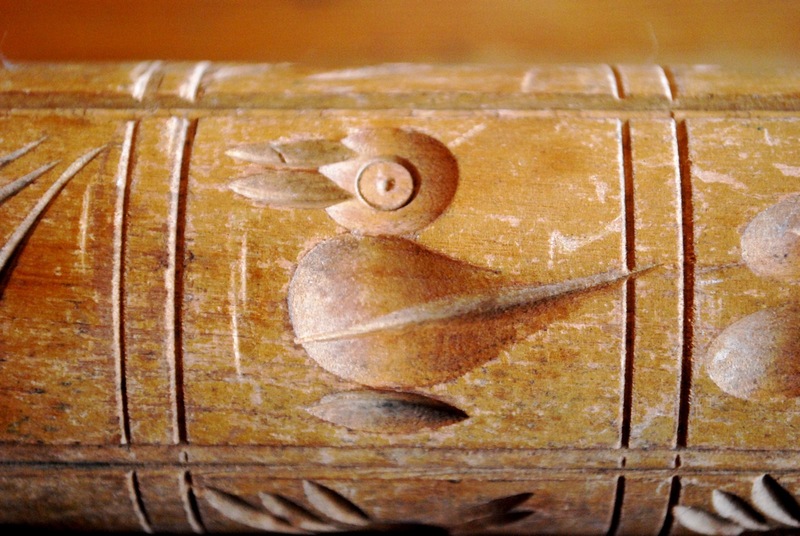 The beeswax can be used on sewing needles to make them glide. 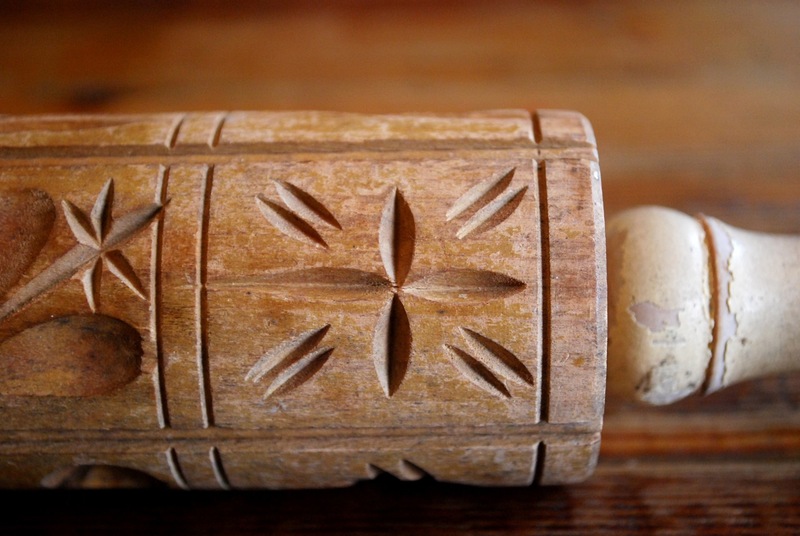 Or rub it on drawers to make them slide more smoothly. I think it's pretty just to look at. I've just finished a big project and think I have a little breathing room. I can catch up on housework, play with new dye ideas, maybe even grab some concentrated knitting time. Is that asking too much? Apparently so. I've made a commitment to help my kids with a big project. It's loads of fun, and I enjoy doing it. While I thought I could squeeze in some other things first, I have to face the fact that there just isn't time. How often does that happen? I'm very clever when it comes to juggling schedules, fitting in one more thing, multi-tasking to the limit. But sometimes the best laid plans don't work out. Every once in a while I have to admit that I can't fit one more thing into the schedule. So the dyeing will have to wait until next week. It's not the end of the world. I've consoled myself with the notion that sometimes it's best to let ideas marinate a little longer. As for knitting I've had to pacify myself with these. More wee people. Still charming. 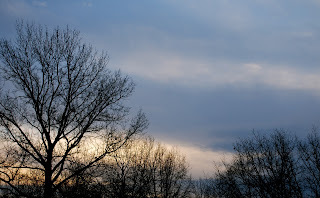 My color inspiration for this week comes from the sky. I love the early morning light this time of year, so subtle and soft. Gray trying to be blue. It's been crunch time the last couple of days as I've scrambled to meet a self-imposed deadline. Writing, rewriting and rewriting yet again. I am often a victim of the eternal edit. And then somehow, miraculously it's time to let go. The Dirty Water DyeWorks website is up and running. Pop over and take a look. To celebrate we are offering free shipping. This is a work in progress. More products will be added soon so be sure to check back. Meeting a deadline like this reminds me of pregnancy and birth - fun and exciting at first but towards the end you just want it to be over. And it's always such a relief when it finally is. While I feel I've earned some uninterrupted knitting time, now I must catch up on all the things that I let slide. There's a mountain of dirty laundry, and I hear rumors that there isn't any food in the house. It's enough work to make me wish I were still facing a deadline. Almost. These days it's all about crafting - discussions about crafting, articles about crafting, ideas for crafting. And then there is Pinterest. I can't go there for fear of losing a day or two. It must be the season. We seem to have caught the crafting bug here. One of my daughters has been hard at work on these. 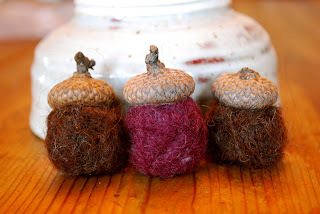 Needle felted acorns. Yes, those are real acorn tops. I have several knitting projects in the works, but I managed to make time for these. And so they wouldn't be lonely . . .
. . . more wee people. 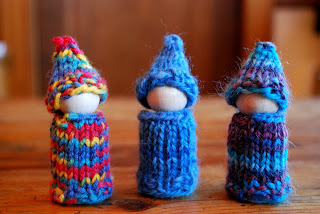 I am enamored of these little gnome-like creations - they bring a smile to my face. If I didn't have so many other pressing projects, I would sit and make them all day long. Maybe I can make a deal with myself and ration them out like candy. If I finish all my work for today, I can make three wee people. 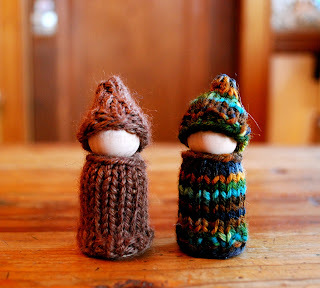 In the spirit of knitting small things I have to share this article with you. 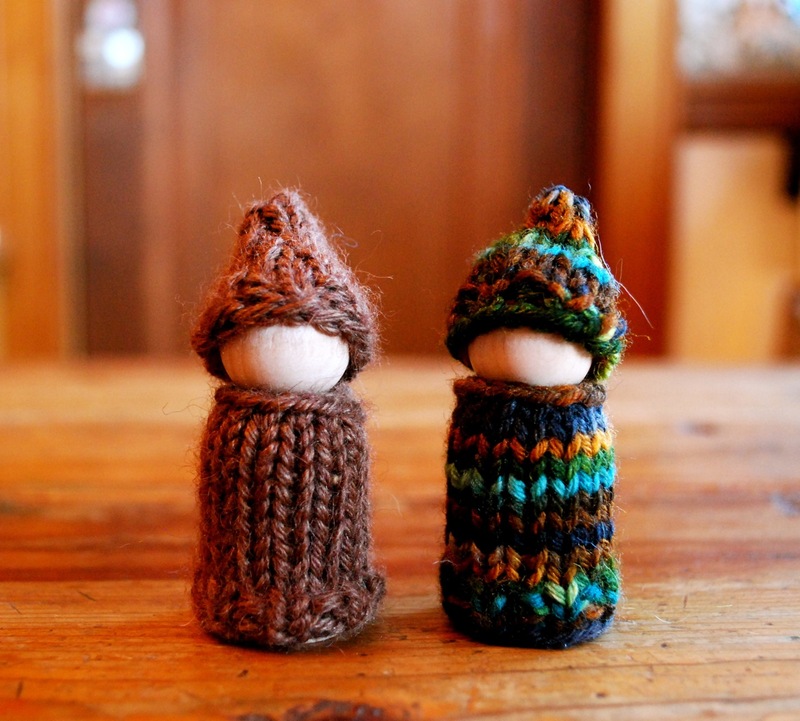 Barbara Walker used to knit doll clothes for fun and relaxation. 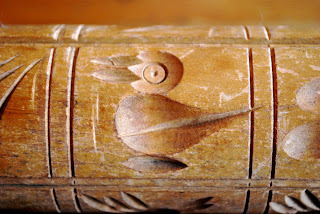 Schoolhouse Press has acquired her doll collection and has posted an online gallery of some of the dolls. Be sure to take a look at the pictures. The details and creativity are amazing. I leave you with music on a Monday morning. It's the day after Thanksgiving, and the pace is more relaxed. 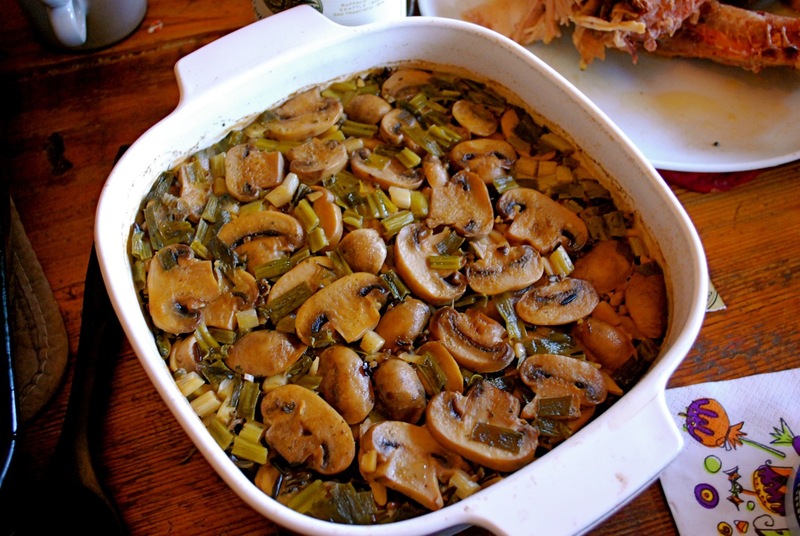 I do most of the cooking, and while I enjoy it, I also appreciate the leftovers and a couple of days off from kitchen duty. 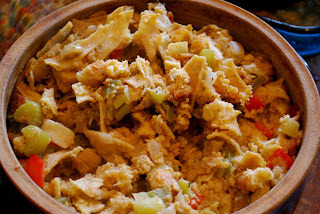 Our Thanksgiving has a decidedly southwestern taste. The turkey is prepared with a chile pepper rub, and the stuffing is made with green chile and strips of corn tortillas. We had many more traditional side dishes. 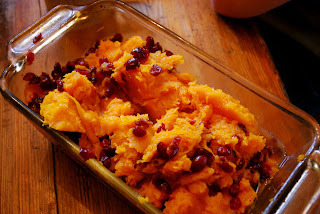 Butternut squash with cranberries and orange juice. And there was dessert. 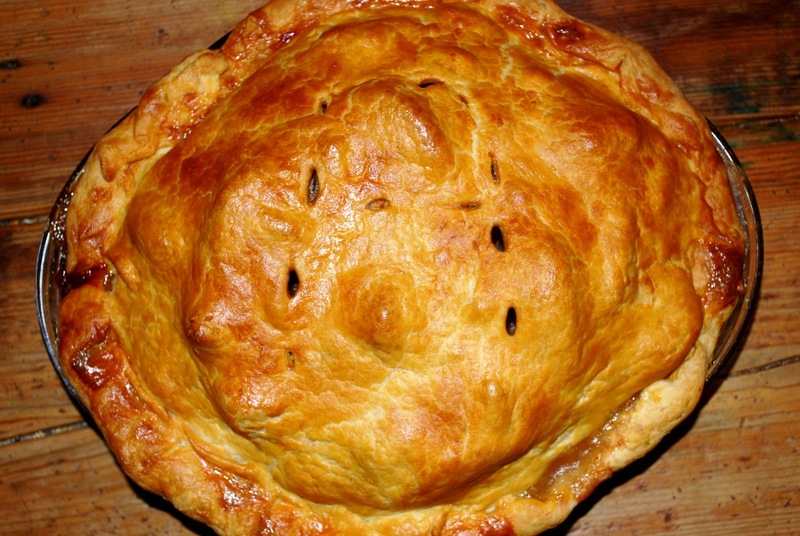 Pies are one of my favorite things, and I go all out at Thanksgiving. "B" is for blueberry. No, I didn't work my way through the entire alphabet, but there were several more pies. And now the long weekend stretches ahead with both work and knitting on my list. This is when the leftovers come in handy. These days it's very stark and gray outside. While we wait for snow to brighten the outdoor landscape, it's harder and harder to find much in the way of eye-catching color. My neighbor's yard has the last glimmer of the fall hues - my color inspiration for the week. Tiny orbs of golden yellow. Like many of you I've been on the run the last couple of days. After various lists and several stops at the grocery store it's all done but the cooking. I think the hardest part is collecting all the ingredients for this holiday. The cooking and baking will be a breeze by comparison. Somewhere along the way while I was picking up, dropping off and waiting I finished the stockinette section of Little Colonnade. Next up is the lace section, and I'm ready for something a little less mindless. I'm looking forward to working on this and another project or two over the long weekend. Over the years I've come to appreciate the Thanksgiving holiday as an opportunity to pause and reflect on what's important in my life. Take a moment. Over the weekend I decided to get a jump on my holiday knitting by making a list of possible ideas. I guess if I were really getting a jump on it I would have done this in July, but for me anything done before Thanksgiving seems like a bonus. I looked at patterns on Ravelry and consulted a short list I had compiled. One idea led to another and another and another. Before I knew it I was flooded with possibilities. Then I hauled out my stash and began sifting and sorting. If nothing else it was good to take stock of my inventory. It's nice to be reminded of what I do have. No, I didn't take pictures and post it all on Ravelry. That would have required all the time I have available for knitting holidays gifts - and then some. In the end I was left with a list of real contenders for holiday gifts. And the best part is I think I can make them all from stash. Here are some of the ideas swirling around. Hand coverings are at the top of my list. The Fletcher Mittens caught my eye. 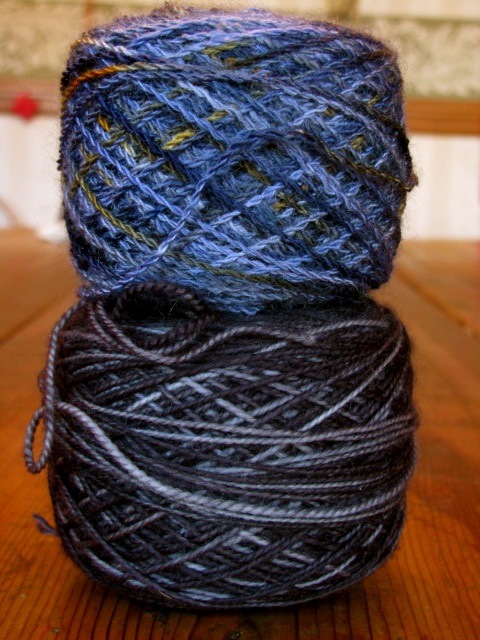 In addition to using variegated yarn they can also be made with two solid contrasting yarns. Many options with impressive results. Then there is Douglas - beautiful colorwork mittens with a liner. The Bittersweet Vines pattern from Anne Hanson is another option. This looks to be a quick knit with the added bonus of a neck warmer. 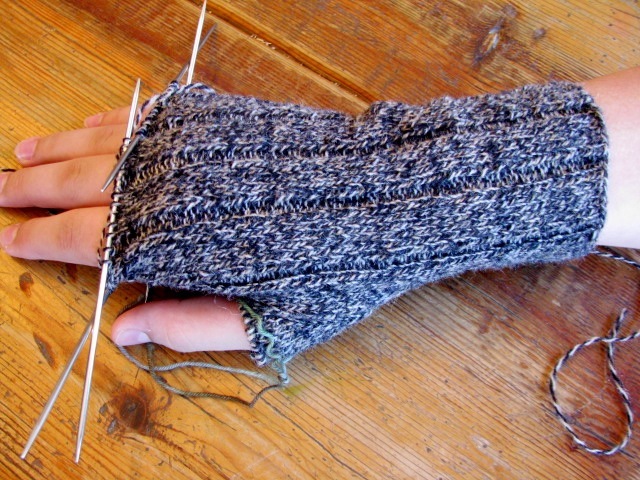 I'm also considering thrummed mittens using a pattern of my own creation. They provide extra warmth with an inside layer of fiber. I'm contemplating a couple of scarves. There is the Carnival Scarf, a feminine little something with a simple pattern repeat. 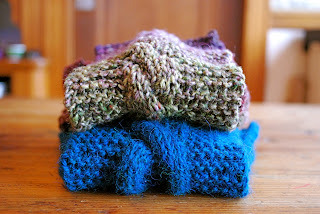 I have a specific request for One Row Handspun Scarf so I know I can't go wrong with that one. Then there are the tried and true felted slippers. I've lost count of how many of these I've made over the years. Very Warm Hat is also on my list. And when I've run out of ideas, there is the pattern roundup list for further inspiration. In addition to thinking about knitting I did some actual knitting over the weekend. I'm on a roll with Man Mitts, another pattern that will probably make my list of holiday knitting. I am further along than this picture shows. I have the index finger done and am waiting for another try on to check the length. Fingers are a bit of a nuisance but not too tedious. I wanted to share an update shot of my Little Colonnade but that will have to wait. I worked on it during a movie in the theater. 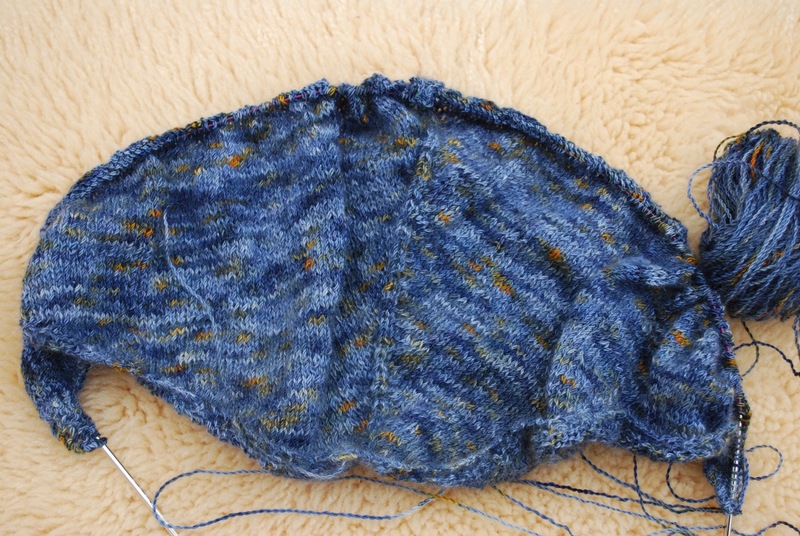 Knitting for more than two hours in the near dark was slow going, but I did make progress. Toward the end of the movie I could feel that something was off. The light revealed an extra yarn over, and I had to rip out one row. I was pleased it wasn't any more than that. And now I'm off to make another list - what I hope will be my final grocery list for the upcoming holiday. Whew! It's Friday already. Where did the week go? It's that time of year when the days are in a race with each other, a race to see which one can whiz by the fastest. In the end they all go by so quickly they are but a blur in my memory. 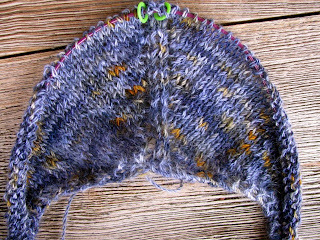 While I can't make time slow down or stand still, I can mark time with my knitting. If I have a meeting or an appointment, I always know I'll have time for knitting. The time spent waiting for kids is more time for knitting. I've started to look forward to those meetings, appointments and waits as designated time for knitting. While I can't always control the pace of my days, I can sweeten them a bit with time for knitting. Last weekend I cast on another round of projects. Most of them have received attention off and on over the week. 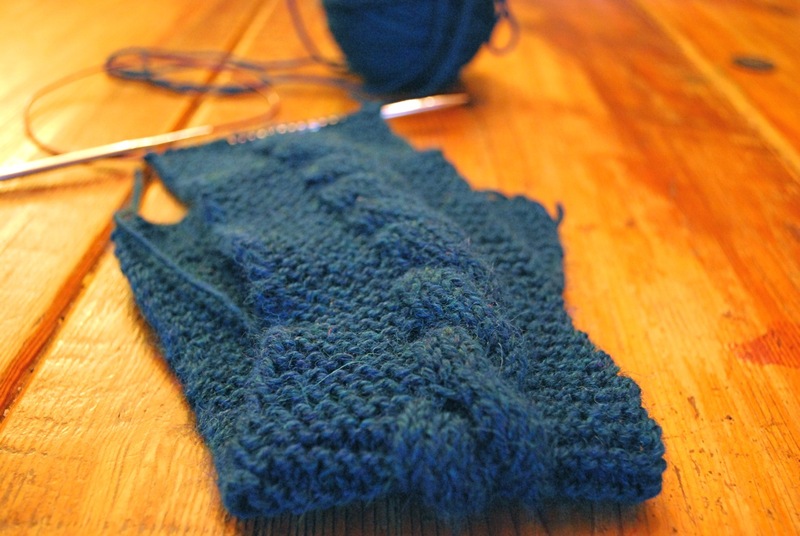 The Man Mitts are coming along nicely. I don't have a decent picture - maybe next time. They seem like they will be a good fit, but only time will tell. My obsession with Pogona is still going strong. I made a Gourd colored one but am reserving that one as a booth sample. I had no choice but to cast on another one for myself. 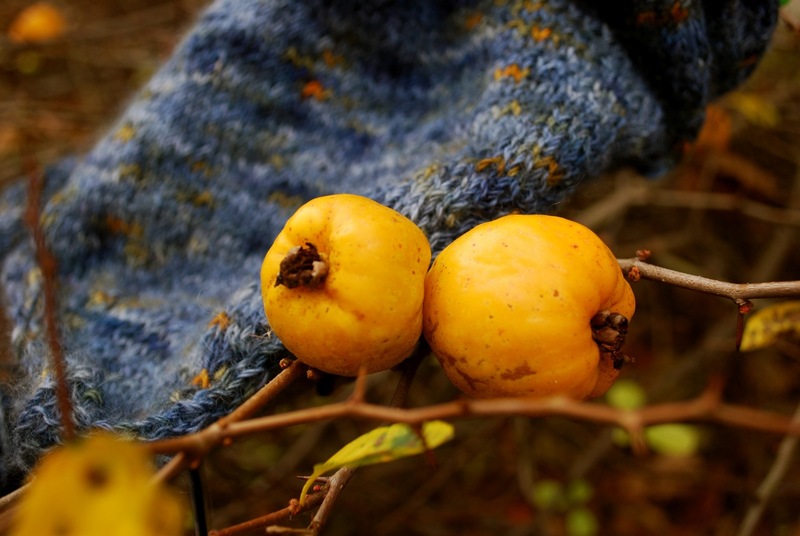 This gray colorway, Pumice, is equally as striking as the Gourd. I had a bit of a hiccup while doing set up rows during a meeting, but I'm back on track now. 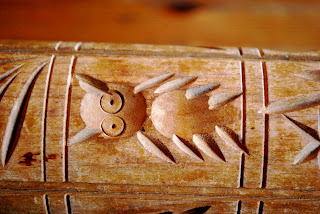 I love the rhythm of this pattern - relaxing but not totally mindless. I'm about to start the third section which will carry me to the end. 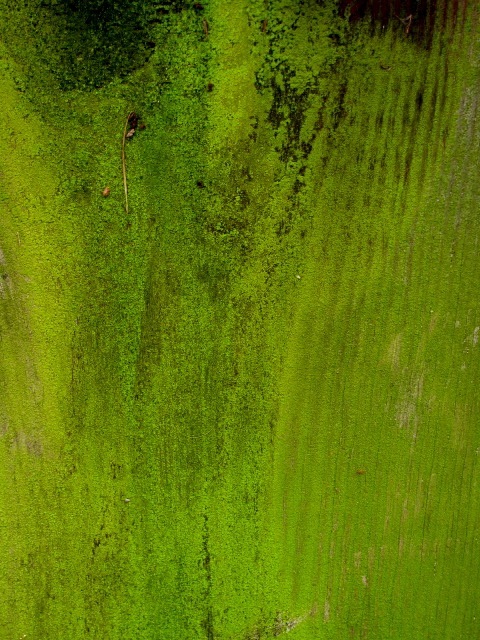 My color inspiration for the week comes from a park where the wooden fence posts are covered with this moss-like growth. Day-glo green. A striking contrast to brown leaves and bare trees. These days I'm in planning mode. 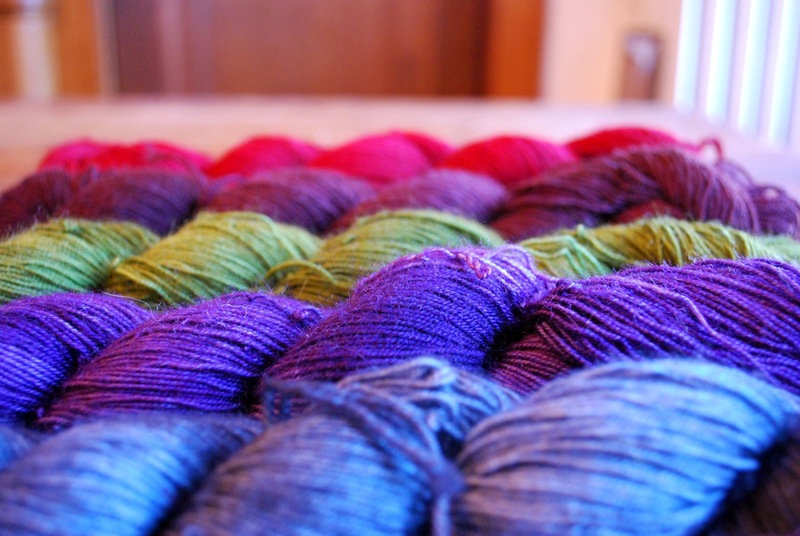 There are new yarn bases to consider, new colorways to ponder. With so many options it's hard to make a decision. Or maybe it's just that the process takes longer. I'm wading through patterns and designs for new additions to the booth. What would I do without Ravelry? I'm also in the midst of scheduling fiber events into next fall. Scheduling my life that far in advance contradicts what goes on with the rest of my life. I rarely pull off one day in the here and now as scheduled. Instead I'm always rearranging my days on the fly. I've come to think of the events as anchors in my life - the fixtures around which everything else must revolve. With all of this planning the dye pots are quiet. For the moment. And that's as it should be. While things may seem quiet, there's plenty of activity simmering beneath the surface. It's all part of the process. For today I have a bit of . . .
~ I love to see men knitting; they are an important part of knitting history. All my sons know how to knit, and I've had an increase in male knitting students in the classes I teach. I was delighted to come across this photo gallery of men knitting. ~ And here's an Icelandic man who knits and crochets. This video clip is charming and instructional. ~ There's an interesting knitting/craft project just getting started in Turkey - a bridge between East and West. It's encouraging to see women from such different cultures uniting around a common passion. 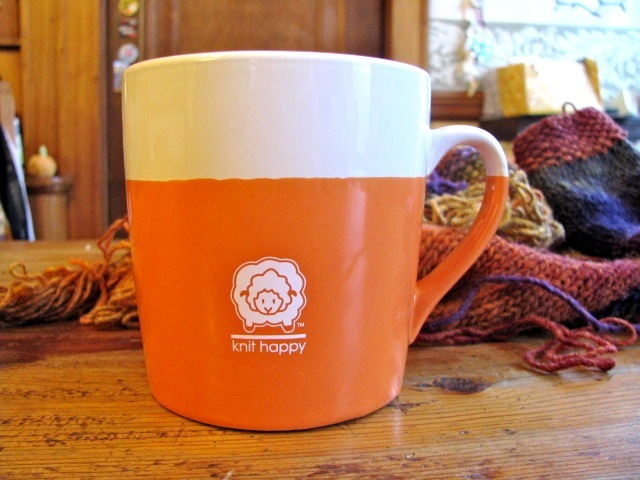 ~ WEBS is having a celebration of the 200th episode of their Ready, Set, Knit! Podcast. The celebration involves prizes, and you can find more information here. ~ And finally, this display of wool felted sails in western Massachusetts makes me want to take a drive just to see them. There are more photos of the installation here. In the mist of all this planning I've found that stopping to knit for a bit can help with the decision making process. Project update to follow. I'm coming off a fiber filled weekend. Last week I told myself I was going to devote one weekend day just to knitting. I did that and more. On Friday I went to the Common Cod Fiber Guild meeting. The guest speakers were Debbie Brisson (aka Stitchy McYarnpants) and Caro Sheridan (aka Splityarn). 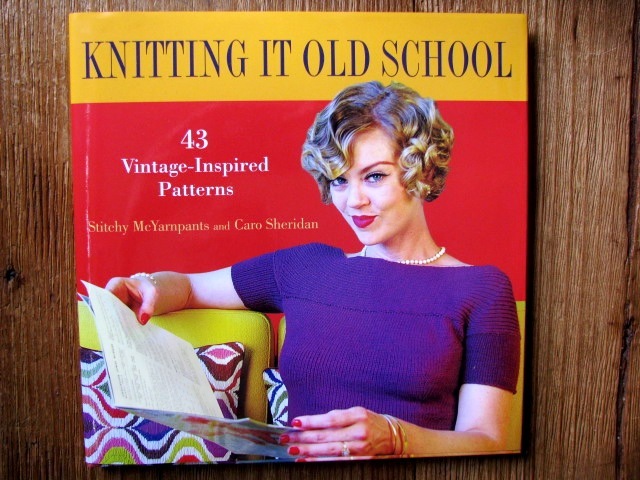 They told the story of how their book, Knitting It Old School, came to be. They discussed their passion for vintage knitwear and how they wrote and re-wrote the book proposal. Then they talked about the writing, the designs, the samples and the photography sessions in LA. As one of the door prizes they gave away a signed copy of their book. Since I had already scored a Bob Hope parking spot for the evening, you can imagine my surprise when I won a copy of the book. Thank you! I appreciate vintage knitwear and will enjoy this book of updated vintage patterns. Debbie and Caro were very entertaining and witty. If you get a chance to hear them talk, you won't be disappointed. This weekend included one day to focus on knitting without cooking, cleaning, laundry and driving. One day may seem like a lot, but when I began to survey all the projects and all the potential projects there suddenly wasn't much time. My strategy was to spend a bit of time on a couple of projects rather than work exclusively on one. I started off by finishing my Maine Morning Mitts. Sorry I don't have a photo - there wasn't a model available. From there I moved on to Man Mitts. I had a request for fingerless mitts with this specific yarn, a Shetland wool from Scotland. I had an issue with gauge and had to knit the cuff twice. 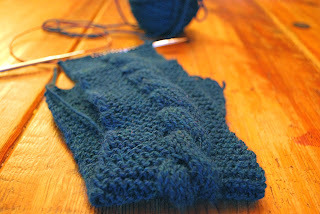 Once I started the thumb gusset I decided to turn my attention to another project. I've been stuck on Stephen West designs, and that theme continued this weekend. This yarn has been teasing me for the last month or so. Gray has become one of my favorite colors, and I love the variation in this colorway. This is Dirty Water DyeWorks Lillian, colorway Pumice. I had it earmarked for Pogona so I cast on. I didn't do much work on it other than to knit through the set up rows. Pogona is my designated companion for all the meetings and waiting time this week. Finally, I contemplated this pattern, one that has been on my list for a while. Rather than fight it, I decided to go with the flow and cast on one more project. More Stephen West - this time Little Colonnade. This yarn is the mohair/cormo blend from Buckwheat Bridge Angoras. I love the little orange flecks and can't wait to watch this one unfold. Now that my needles are stocked with new projects, I should be busy for a while. I leave you with this pattern to ponder - Knitted Kaleidocycles. If you want to see them in action, go here. I'm fascinated with the math and the construction involved. Hours and hours of entertainment, both in making and in using them. 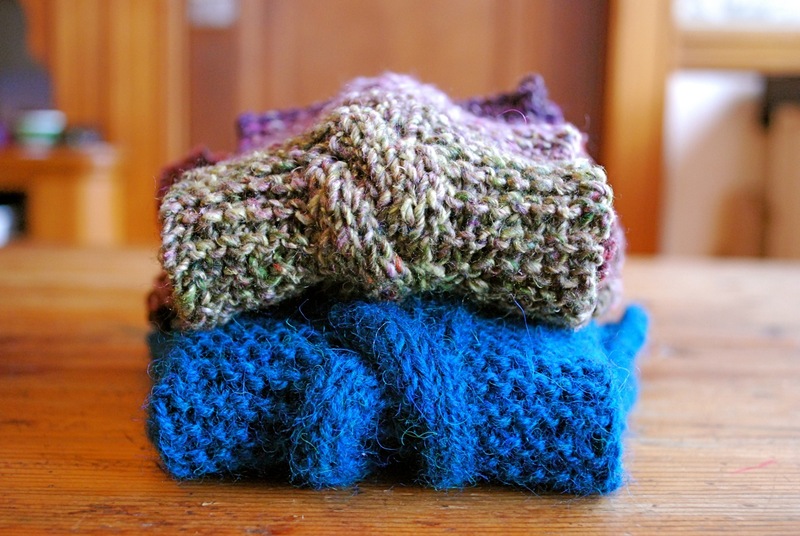 This is the weekend for knitting retreats. Here in New England Clara Parkes is holding her annual Knitter's Review Retreat. Clara has a weekend of classes, shopping and entertainment lined up for attendees. Half way across the country there's the Mitten School, a weekend devoted to mittens with Adrian Bizilia. How cool is that? It sounds like an intense, stimulating and fun weekend. And finally, on the West Coast there is the Silk Retreat hosted by Stephanie and Tina. You can bet there's all kinds of wild craziness going on there. In the spirit of this knitting retreat weekend I've decided to have my own mini retreat. For one day this weekend I will do nothing but knit and relax, possibly with a bit of spinning thrown in for good measure. I will put the rest of my life on cruise control. The last two months have been crazy busy - like a merry-go-round out of control. It's time to take a break. To prep for this mini retreat I've had the swift going. 'Round and 'round she goes. There are many projects I could work on, and I haven't even contemplated holiday knitting. Are there really only 42 days? I've started to line up a couple of options, but somehow I don't care so much what I'm working on. It's more important to enjoy the moment, relax and catch my breath. It's good to step off the merry-go-round once in a while. 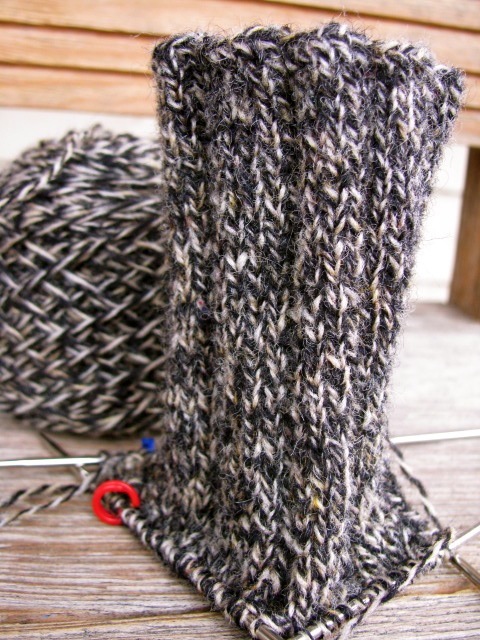 For those of you in the area tonight is the Common Cod Fiber Guild meeting. We will be treated to Knitting It Old School with Debbie Brisson (aka Stitchy McYarnpants) and Caro Sheridan (aka Splityarn). What a great start to the weekend! By way of follow up the name that turkey contest has been closed. WEBS has released the pattern as a free pattern, and you can find it here. While the name #351 Knit Turkey is a bit disappointing, he's still adorable. I leave you with my color inspiration for the week. 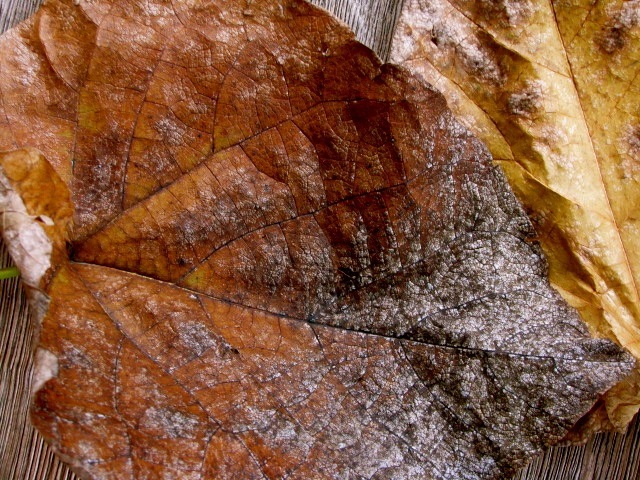 Most of the leaves have fallen, brittle and decaying. Fiber festivals are a wonderful place to meet people - people with whom you wouldn't connect otherwise. This past weekend I had the pleasure of meeting Christiane Burkhard of Lismi Knits. Christiane has designed several patterns including Patches Baby Sweater for the new Sock Yarn One-Skein Wonders book. If you haven't seen this book yet, it's definitely worth your while to take a look. Christiane showed me one of her new designs, a shawl. I loved the pattern, and we were discussing it. The pattern doesn't have a name, and Christiane is running a contest to name it. One thing led to another, and before you knew it we had collaborated on the naming contest. The winner of the contest will get a copy of the pattern and a skein of Dirty Water DyeWorks yarn. 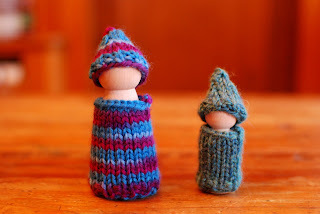 Pop on over to Christiane's blog and have a go at naming that pattern. There's another contest underway - a turkey naming contest. WEBS has an adorable turkey pattern - almost as cute as the penguins and polar bears. Name that turkey and win a prize. Even though my shopping time at Fiber Festival of New England was limited, I did manage to come home with a couple of items. Near the end of the day on Sunday I dashed to Buckwheat Bridge Angoras for a little something. Buckwheat Bridge is a sustainable farm that is solar and wind powered. 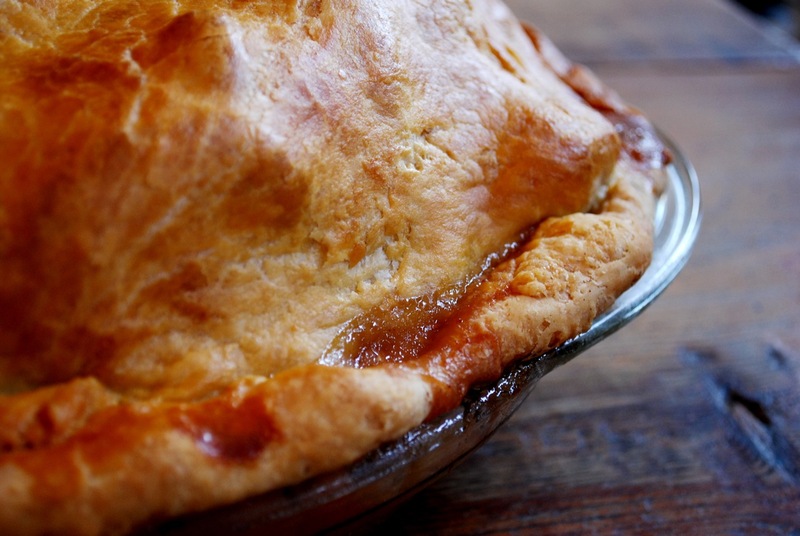 Their products are made only with the fiber they produce on their farm. This is a Kid Mohair/Cormo Wool blend. They had a whole wall full of tempting colors. It was a hard decision, but I fell for the splashes of orange in this colorway. This yarn is calling me, and I think I may have to cast on . . . soon. I have a weakness for coffee mugs so when I stumbled across these at Hither and Yarn I just had to get one. It's in keeping with my orange theme and has a great message.